Gov. 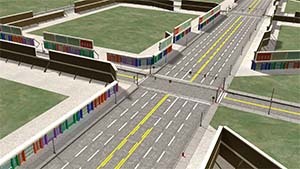 Rick Snyder, along with business and government groups, are working to develop a 335-acre test facility for autonomous and connected vehicles, called The American Center for Mobility, at the former B-24 manufacturing plant at Willow Run in Ypsilanti Township. Rothwell says after looking at Willow Run, the organization, along with the University of Michigan, Michigan Economic Development Corp., and Ann Arbor Spark, saw the opportunity to take the concept of M City (a 32-acre test facility at the University of Michigan) and scale it to a much larger size. â€‹Rothwell says The American Center for Mobility, expected to be completed in the next two to three years, will include a three-level interchange, a high-speed loop, connected infrastructure, along with simulated urban and rural environments. Rothwell says the project could cost up to $80 million. A developer has not yet been selected. He says a 501c3 will likely be set up, and a master developer and project manager will then be selected.